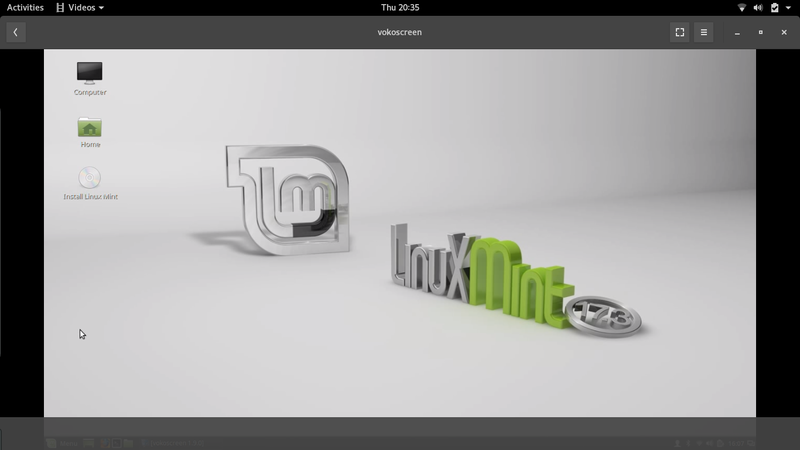 A few weeks ago I wrote an article highlighting the 5 Linux distributions I would recommend to the Everyday Linux User. A number of comments came in recommending other distributions so I set a challenge asking people to nominate the 5 distributions they would recommend to the ordinary guy or girl. One of the suggestions that came up multiple times was Antergos. Antergos is an Arch based distribution and for the average Joe I would ordinarily stay clear of Arch because it requires a certain dedication to keep your system running. The way I like to think of it is that most of us drive cars. Some of us drive cars to get from A to B and others of us really drive cars. Some people know about engines and care about really intricate things that the rest of us don’t care about. I’m thinking along the lines of “Pimp My Ride”. Not everybody is going to take their brand new Kia and add twin exhausts, a spoiler and an expensive sound system in the back. Some of us just need a way of getting the dog to the beach. In that sense Linux is the same. Some people just want to browse the internet, watch videos, keep up to date with friends and write the odd letter. Arch isn’t for these people. However Antergos is branded as a user friendly operating system which just so happens to have an Arch underbelly and knowing how well Manjaro have achieved the same feat I decided it is definitely worth giving Antergos a go. So here it is…. my first review of Antergos Linux. The Antergos website is available at https://antergos.com/. You can download Antergos by visiting https://antergos.com/try-it/. The live image lets you try out Antergos with the GNOME desktop although you don’t have to stick with that and I will explain why later on. I recommend downloading the live image over the minimal image unless you know what you are doing. You can create a live USB drive from the downloaded live image by using the Win32 Disk Imager tool. This guide shows how to create a bootable USB drive. Simply replace the Ubuntu image suggested with the downloaded Antergos image. If you would prefer to buy a bootable DVD or USB drive you can do so by visiting this page. When you boot into the live image of Antergos you are given the choice to try it out or to install it to the hard drive. 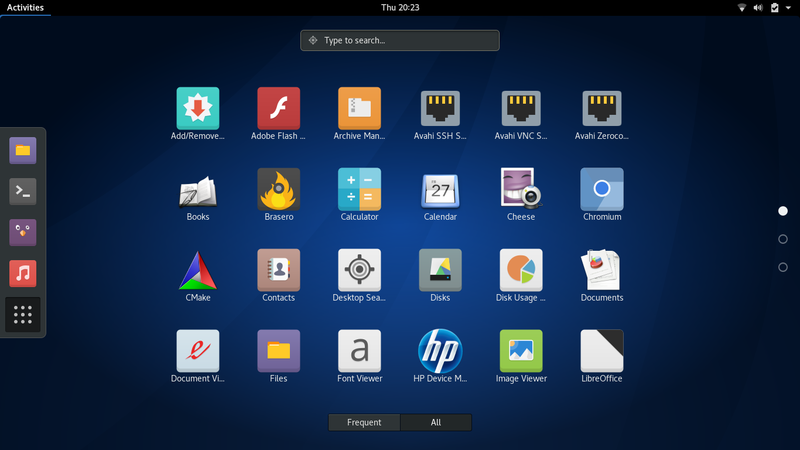 It is worth trying the live image to get a look and feel as to how it works but if you plan on using a different desktop to GNOME then you might want to go straight to the install. Before you start you should backup your computer especially if you plan to dual boot because the Antergos installer states that it is in BETA. The installation itself is fairly straight forward except for perhaps the partitioning when you want to dual boot with another operating system as it doesn’t appear to pick up other operating systems so you have to manually set the partitions for installing Antergos. So to briefly whizz through the installation, the first thing you have to do is choose the installation language. 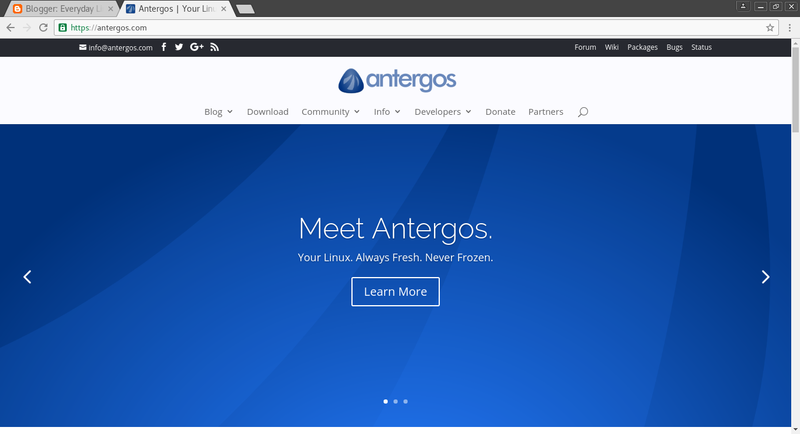 The second screen shows you how well prepared you are for installing Antergos. One key element is that you must be connected to the internet in order for the installation to succeed. To connect to the internet simply click anywhere in the top right corner and choose networks. A list of wireless networks will appear. Choose one of the networks and enter the security key. If you are using an ethernet connection your internet should already be working. The reason why you need an internet connection will be made clear later on. The next step is to choose your location from a list of territories. This is shortly followed by a screen where you have to pick your exact location for the timezone. You will then be asked to select your keyboard layout. Up until now this is all fairly standard stuff but the Antergos installer lets you choose the elements you wish to install. 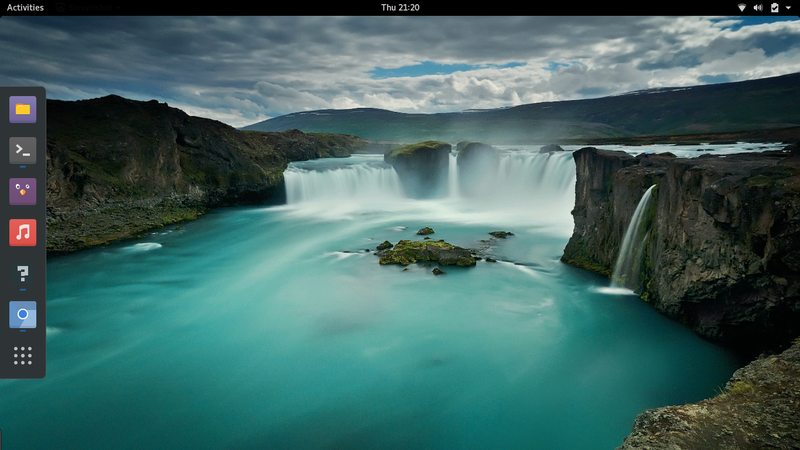 For example the first stage is to choose the desktop you wish to use. 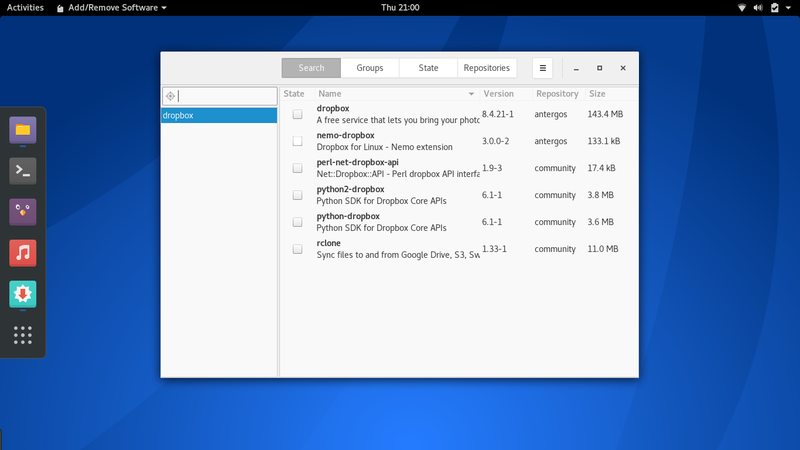 The options are Cinnamon, GNOME, KDE, MATE, Openbox and Xfce. If you want something else then you can either choose one of these now and install another one later or go for the base install which doesn’t install a desktop at all and then install a desktop post installation. The next step lets you choose from a range of elements to install. For instance you can choose whether to use the Arch User Repository (and I recommend that you do). The AUR is one of the largest repositories for software applications there is. You can add bluetooth support, choose either or both of the Firefox and Chromium browsers, add Flash support, add extra fonts, add LibreOffice, include printing support, add Steam and PlayOnLinux and Windows sharing. The more you turn on, the longer the installation takes. The next step is the partitioning. If you want to dual boot then you need to choose manual partitioning. Within the manual partitioning you can choose which partitions are used for root, home and swap and you can choose where the EFI boot loader is. For installing standalone as a single operating system it is simple. For dual booting it isn’t as straight forward as perhaps Linux Mint or Manjaro. Before you start the installation a summary appears telling you what is about to happen. Having reached the summary I thought that would be it but suddenly the user setup screen appears. I would have expected this to be earlier in the piece. Creating a user is as simple as entering your name, giving the computer a name and setting the password. You can now sit back and relax whilst the installer does it stuff. Now here is a little issue and it is an issue many people outside of city centres face. My internet connection isn’t the greatest and the way the installer works is much like the Debian minimum install. The files that are required for the installation to occur are downloaded as part of the installation. I have already downloaded 1.7 gigabytes to get the live image but now I have to wait ages to get the full version to install to my hard drive. I ended up leaving the process going overnight. When I woke up I was happy to see that Antergos has installed correctly…… well almost. I had set Antergos to dual boot with Windows 10 but when I rebooted the system booted straight to the GRUB screen and the GRUB screen didn’t contain an entry for booting to Windows. Some people might get alarmed at this point. “Where has Windows gone? Has it been deleted? Oh flips all my files were on the Windows partition!!!!”. I rebooted the computer and pressed the F12 key to show the bootable operating systems and Windows was still there. All I needed to do therefore was to fix GRUB so that it added Windows as an option. (I will show you how to do this in another guide). 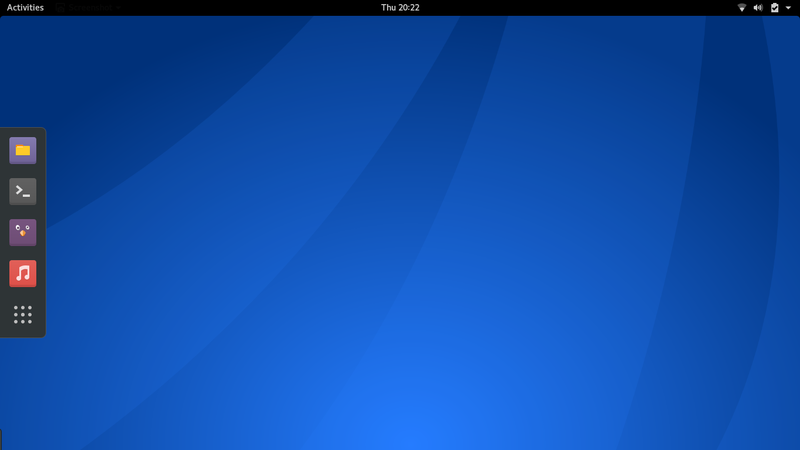 I chose the GNOME desktop as it is my favourite and most people will find it easy to navigate and use. The background for Antergos is tidy if not very exciting. 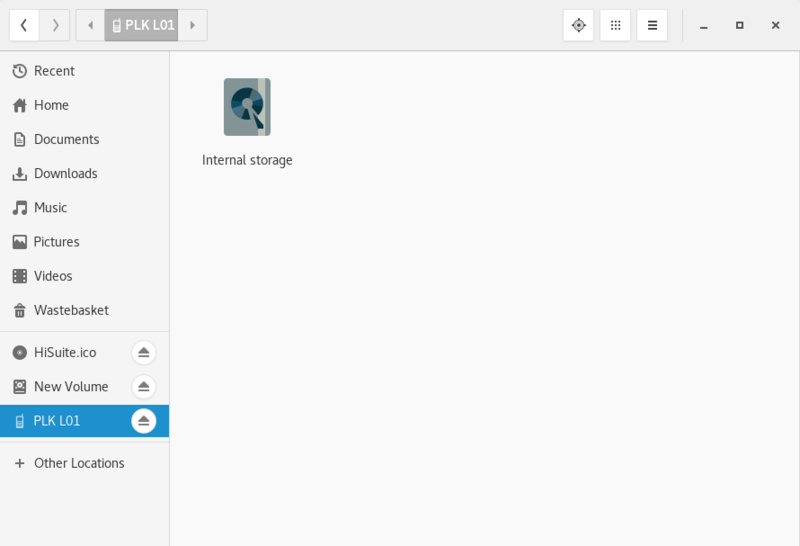 To find your applications and files you can simply press the super key and a dashboard style interface appears. The easiest way to find what you are looking for is to enter a term into the search bar. I know this part of the review isn’t everybody’s favourite but I think that a nice vibrant desktop wallpaper makes me more productive because it isn’t dull and boring. To change the wallpaper click on the super key and start entering “background” into the search bar. An option will appear called “Background”. 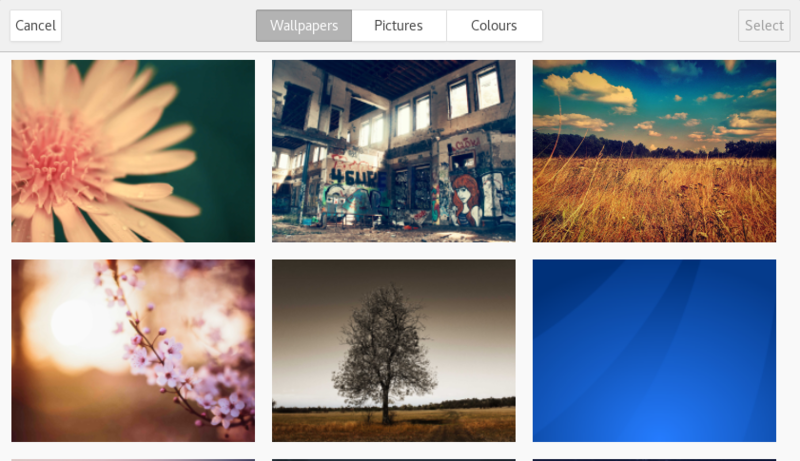 Antergos has a nice selection of wallpapers available but you can choose one of your own or download one from the internet. You can also choose a plain colour if you so wish. Antergos is fairly minimalist in terms of the software that comes with it and I will come on to this later on in the review. The audio application within Antergos (GNOME version) is GNOME Music. In order to play music you need to copy it to the Music folder on your computer. I didn’t have any music on this computer as it was a clean install so I decided to see how well some of my external devices behaved. Whilst audio devices don’t appear to work directly with GNOME Music you can open them using the file manager and as you can see my mobile phone was picked up correctly as a storage device. 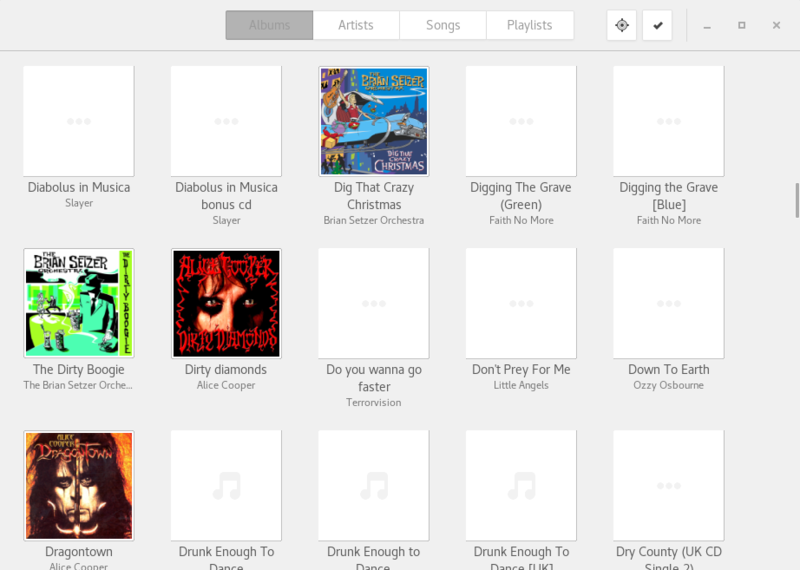 I was therefore able to copy files from the phone to the music folder. I also had my Sony Walkman with me (no not the big cassette player from the 1980s) and so I plugged it in and it too was picked up as a storage device. 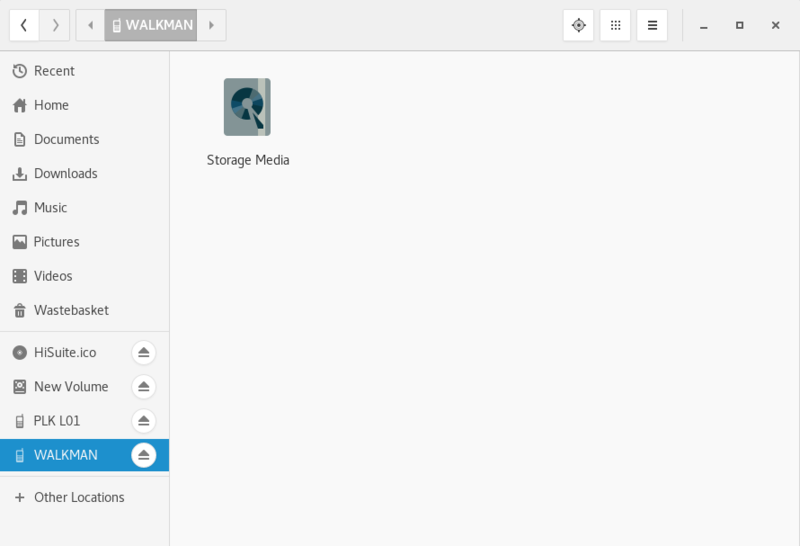 I copied all the music from the Walkman to my Music folder and GNOME music picked it up correctly and I was able to browse by artist, album, song and playlist. 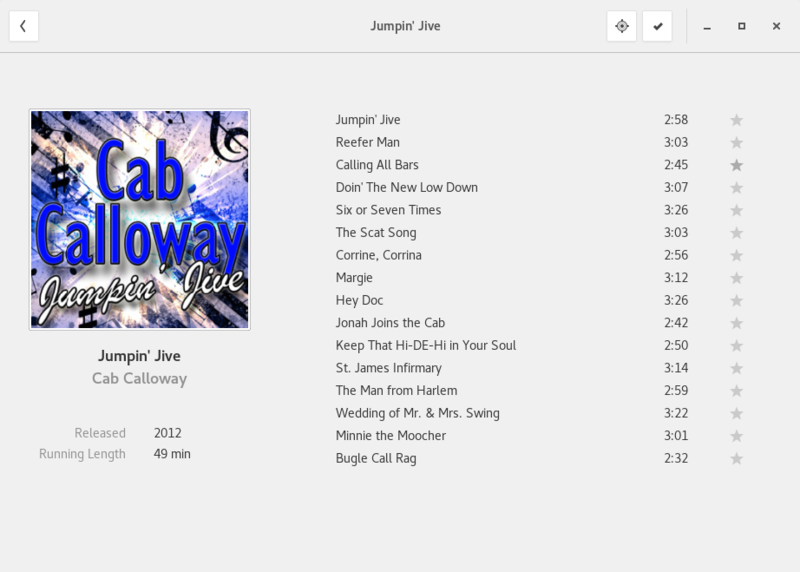 MP3 playback worked perfectly and there was no need to install any extra codecs. To be honest I can’t remember the last time I installed a Linux distribution that required me to install extra codecs unless you count Linux Mint and Ubuntu but I don’t think they count because they both provide an option during the installation stage. Whilst we are on the subject of audio playback I decided to try and play a song straight from the file manager but this isn’t an option so I clicked on the file and it opened in the Totem video player. 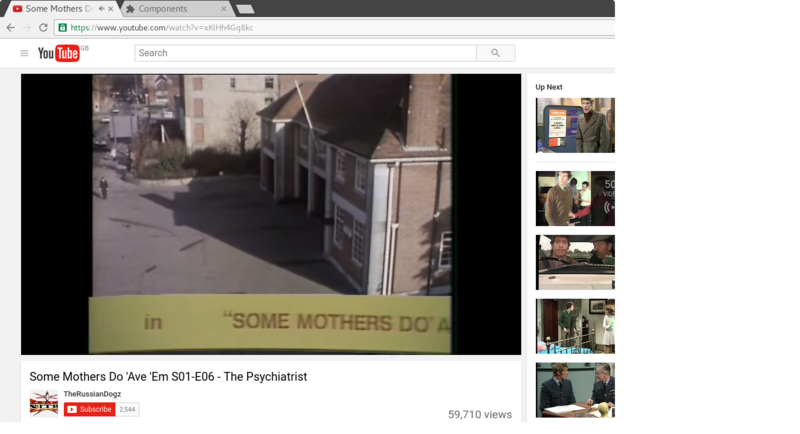 I’m not sure if this is deliberate but it seems strange that the video player is set up as the default player for audio and not the audio player. 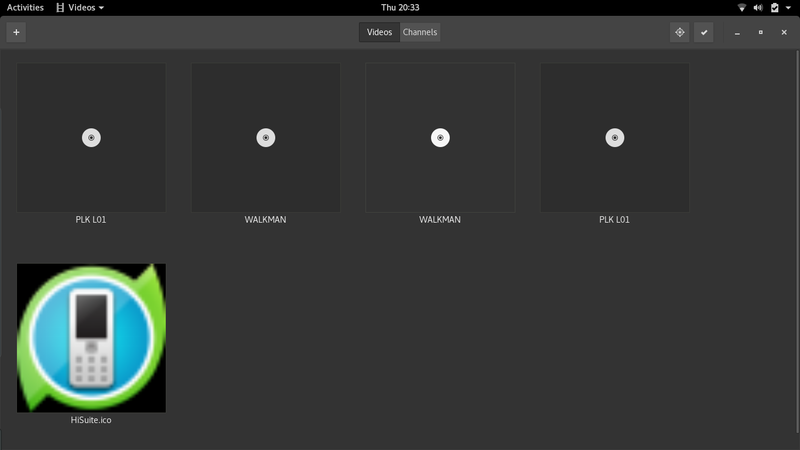 The default video player in GNOME is Totem. I’m not sure why though. It always feels very clunky to me. Look at the screenshot above. Totem has picked my Walkman and my phone as videos. If you click on them they of course fail. The channels option used to have Youtube but now it has a list of fairly random channels that I will never watch. You can add your own local videos by clicking the plus symbol and navigating to them or you can just find the file within the file manager and click on it but the interface is very strange. I much prefer VLC. The video playback works perfectly well. Now here is a subject I like to rant about. The one program guaranteed not to work anywhere ever except on a Wednesday whilst dancing on one leg, whilst singing the Finnish national anthem is Steam. I can choose the same distribution on 2 different machines and Steam will work on one and not the other. Instantly the cries come in about it being a graphics issue except for the fact that I can use another distribution on the same 2 machines and the one that was working before now doesn’t work and vice versa. 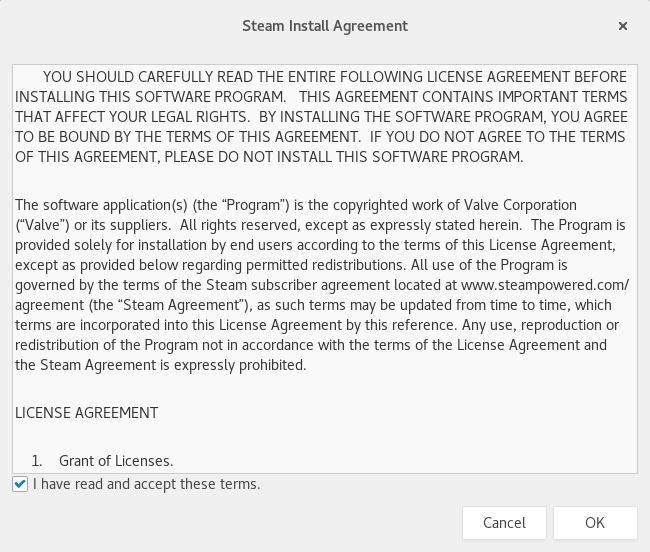 Why is it so hard for Steam to build an installer that works every time. I am so hoping that Ubuntu produces a snap package for it. Needless to say that with Antergos Steam fell on its knees and begged for mercy. I tried jumping through the hoops on the forums and these are the same hoops I jumped through for Ubuntu and many other distributions but to no avail. Initially it just didn’t run and then after running a command it did the update thing and then nothing. Don’t let this put you off Antergos because it isn’t an Antergos thing. The problem is with the naff Steam installer and you will probably install Antergos and it will work perfectly for you. I opted to add the printing support as part of the installation stage and it didn’t let me down. Simply search for printing in the dashboard and the print settings option will appear. You can choose to add a printer and as you can see it picked up the printer that was available from the hotel I am staying in this week. I printed a few test pages and it worked flawlessly. I have largely stopped worrying whether Flash works or not because most videos nowadays don’t use it. Youtube is a good example of this. 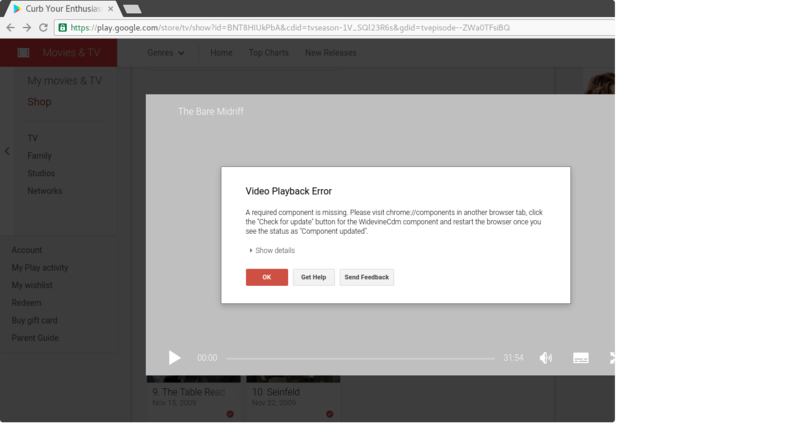 The error complained above a plugin required to play proprietary videos. 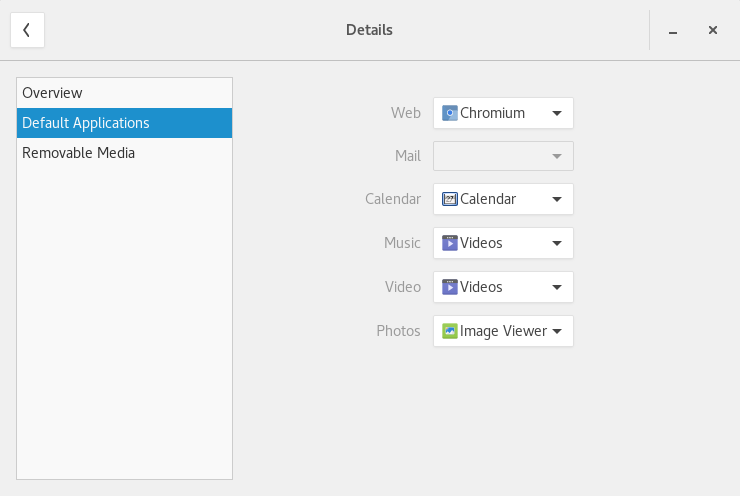 This will add the Chromium Widevine plugin into Chromium. You then have to visit chrome://plugins within the Chromium browser and check the box to allow it to run. The moral is to not let one small issue “Curb Your Enthusiasm” towards Antergos. I covered this earlier on during the installation stage but just in case you missed it here it is again. 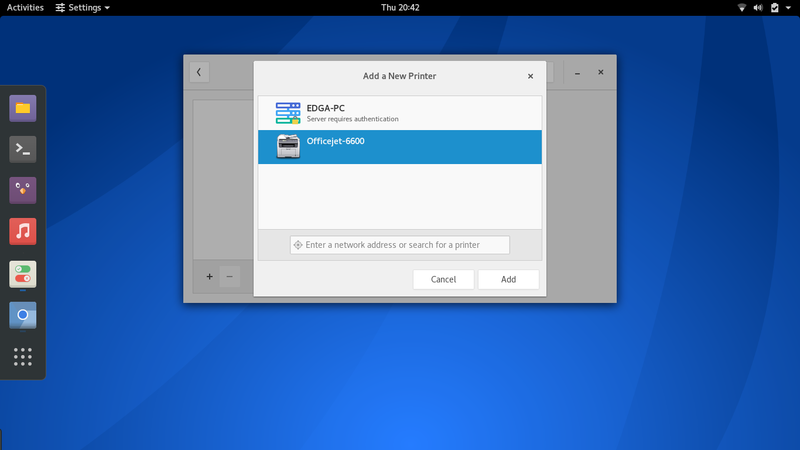 Connecting to the internet using GNOME is as simple as clicking in the top right corner and choose the network connection option. A list of wireless networks will appear and you can choose one from the list and enter the password. If you chose an internet connection whilst installing Antergos it will have been retained post installation. Antergos doesn’t come with much software by default but you do get the basics which include a web browser, chat client, audio player, video player, file manager etc. If you chose to install Steam and PlayOnLinux during the install then they will be installed as will LibreOffice. Antergos has a fairly basic software tool for installing software but it is all purpose and does the job well. Simply enter what you are looking for into the search box and a list of options will appear. It is worth learning how to use command line with Antergos as you will inevitably want to use both pacman and yaourt to install other software packages. So Antergos was recommended to me by a number of people and I have to say that the experience was decent. It isn’t difficult to install Antergos but if you have a slow internet connection then you have to be a bit patient. Most things worked ok and hardware support was fine across the board. The Steam thing I put down to something that the Steam developers need to resolve. Come up with a better installer. Would Antergos make my top five now that I have tried it? I would say no to that. It isn’t as good as Manjaro and that is the best distribution to pitch it against because they are both based on Arch. Manjaro has a more polished look and feel. Nevertheless Antergos is a good distribution and well worth a try. It doesn't take long to install Numix-Circle icons and Elementary cursors. Antergos is more about automating an Arch install with some reasonable defaults than forking another distro. While I agree on the points the tester made he left out two big ones I love about Antegros. First its not filled with many programs so small foot print on hard drive and 2 its always fresh with latest stuff on install no big updates needed once installed unlike mint ,Ubuntu ,fedora or suse. Try Apricty OS. Easy Arch based distro. Can't be simpler. I tried to run Steam on Arch a week ago and didn't get anywhere. Installed Antergos last night and Steam worked out of the box after I installed the correct Nvidia drivers and libraries. No idea what went wrong with Arch and why it works now- could've been a driver update, package update, Steam update, or simple operator error on my part. At any rate, Antergos is a nice GUI installer for a functional Arch system. Don't expect a lot more than that. I don't think it has any scripts or GUI to install the Nvidia kernel modules, etc. Linux "for everybody" is a pretty silly claim at this point in time. Your comment concerning Manjaro is quite different than my experience with it in comparison to Antergos. I have had numerous update issues with manjaro in the past and since moving to antergos, I have not had any issues. 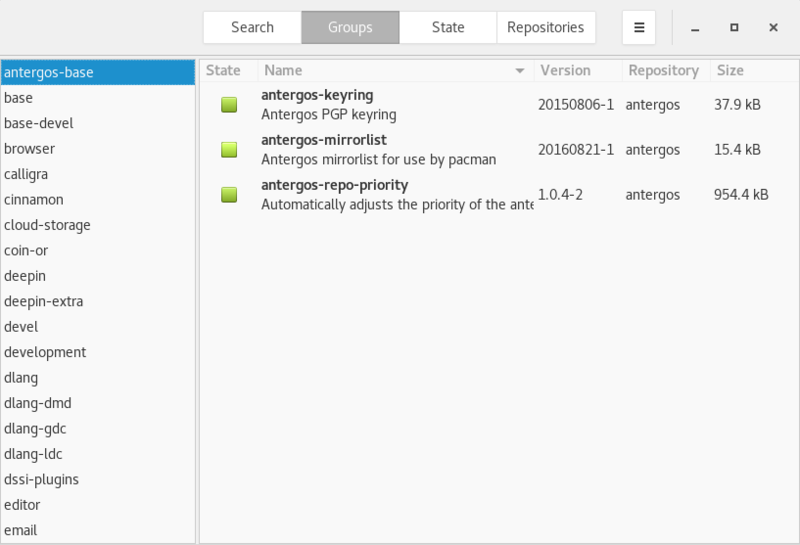 Also, Antergos is fr more up to date than Manjaro and uses the arch repository. If Manjaro can get its update issues resolved I would be one of the best distro's out there. My preference is still Debian but Antergos for me is a close second. What are the minimum requirements for Antergos?